a way to track our literary pursuits in our home, as well as personal. we are all always reading. i believe if you can read, you can teach yourself most anything. as a family we are reading Mara, Daughter of the Nile. as the kids are all studying world history, this one follows. this would be a good adult fiction read, as i myself am thoroughly enjoying the story. it has intrigue, mystery, a little bit of possible romance. mostly it is a delightful and descriptive look into egyptian life during the reign of hapshetsup, the female pharoah. another book of seth's happens to be a reader for history that he says he "just can't get into". and that is Hittite Warrior. again a very descriptive look at life during the early tribal years of europe. it obviously includes hittites, as well as canaanites and it appears a few lowly hebrews. i like the book, even if he does not. on my nightstand currently is a book fueling a renewed habit in my life. (habits: for another post). that is the habit of de-cluttering. Too Much Stuff by kathryn porter is the fuel. not only is the book written in a witty and convincing manner, but kathryn is a woman of faith too. of course i love that! she is eager to tell the why of de-clutter and maintain the stuff in our lives, and she also takes you room by room to show the how of it. my goals in this area will not happen over night, as it is just like life: a journey. i just finished The Singer by calvin miller. how i love that book. it is beautifully written pose about the cosmic conflict between good and evil. in the spirit of the holiday of easter it is a timely read. well, i guess that gives you the end of the book: the good guy wins. 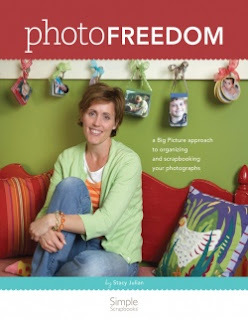 and...a book i have been waiting for since i first heard about it on ali edwards blog, is stacy julian's PhotoFreedom. all in the spirit of de-cluttering, she explains her system of sorting, storing and getting those fav photos on lay outs. i read half of it last night in one sitting. it will take my mind a bit to wrap itself around some of her concepts. she goes about her actual albums differently than i have in the past. but it's all about adapting what works for one in their own world of scrapping. her ideas are timely, and very doable. this is a great resource even if one is not an avid scrapper, but has photos and likes to take pictures.